What if accelerators could be more compact and more cost-effective? The vacuum group of the HL-LHC collaboration had to innovate in a lot of aspects. Header image (Figure 1): Technological breakthroughs in light generation and selected applications enabled by qualitatively new light source capabilities (for image sources see below*). Methods for generating light pulses that are much shorter and brighter than currently available has been set out in a new paper by an international collaboration of accelerator scientists . Figure 1 shows how throughout history the breakthroughs in light generation have revolutionized our ability to study smaller and smaller objects, from microcrystals to viruses and even to individual atoms. The discovery of X-rays at the end of the 19th century enabled diffraction imaging at the atomic scale while, with the invention of synchrotrons in the 1940’s, the photon flux became sufficient to capture the diffraction patterns of nanocrystals in the 1970’s. The time resolution at the atomic scale from these X-ray sources was, however, severely lacking. Meanwhile, the progress in conventional laser technology, born in the 1960’s, together with the invention of chirped pulse amplification (CPA) developed in the 1980’s, now enables lasers to generate sufficient intensity to drive High-Harmonic Generation (HHG) in gases which can output attosecond duration pulses of light. However, while the femtosecond barrier was broken by laser technology and HHG, the spatial and temporal resolution potentially offered by accelerator-based X-ray sources, remains beyond their reach. The Free-Electron Laser (FEL) is a cutting-edge, accelerator-based instrument that has the potential to provide simultaneous access to the spatial and temporal resolution of the atomic world. In a FEL, ultra-short electron bunches from an accelerator are passed through a long undulator magnet to generate coherent light. Recently, scientists from SLAC demonstrated the first generation of attosecond hard X-ray pulses, using the Linac Coherent Light Source. Now, as described in the review article by Alan Mak et al. , researchers are proposing developments that will make the FEL a fully coherent, single-cycle (attosecond) X-ray laser. The new concepts build upon a strong nexus between linear accelerators, FELs and quantum lasers, to produce extreme attosecond pulses with controllable waveforms. Figure 2: The left plot in the panel (a) shows the minimum pulse duration attained over time with various demonstrated (blue) and potential (red) technologies while the right plot of the same panel depicts typical temporal waveforms. For simplicity, the period of the carrier is taken to be the same. The panel (b) presents the state-of-the-art of the pulse energy achievable by short-pulse light sources. The HHG and novel undulator concepts deliver few-cycle light pulses whereas the FEL sources shown in the figure deliver light pulses of significantly more than a few cycles. Adapted from . The need for the development of a new attosecond technology is motivated by the diminishing progress in the generation of short pulses with conventional lasers, as depicted in Fig. 2a. The combination of CPA and HHG in gas allowed laser technology to break the femtosecond barrier in the 2000’s, but the initial rapid progress in pulse duration reduction has since levelled off. Another issue with conventional lasers, is that the pulse energies, critical in attosecond science, decrease rapidly as the pulses get shorter as shown in Fig. 2b. On the other hand, the attosecond regime is shown in simulations to be accessible via methods based on coherent radiation from undulators . Moreover, it is seen that the pulse energy of undulator-based attosecond sources may exceed the pulse energy of the equivalent conventional laser sources by three orders of magnitude for the same pulse duration. The sub 50-attosecond, high-energy light pulse generation predicted from undulator-based technology, can therefore open up and provide access to the uncharted territory of the fastest time scales in atoms. Figure 3: Sudden radiation damage upon ionization in bio-relevant molecules and in DNA, in particular, is related to the electron-hole dynamics occurring on the sub-femtosecond scale. An important scientific application of such intense attosecond pulses is the study of electron flow from one region of a molecule to another, so called charge migration, which is a fundamental process in biology. As illustrated in Fig. 3, intense radiation can induce charge migration that leads to DNA and cell damage. Detailed investigations of the mechanism of charge migration are essential for understanding the processes that result in biological malfunction. Such knowledge can be obtained using the high temporal and spatial resolution offered by the proposed developments in undulator attosecond technology. The authors of the review article have recently expanded their collaboration to form the LUSIA consortium (Towards Attosecond SIngle-cycle Undulator Light). The objectives of the consortium are to shift the paradigm of FEL pulses from long multi-cycle output, towards tailored single-cycle pulses. They aim to conduct proof-of-principle experiments leading to the development of a new enabling technology for attosecond science. * Copyright of images used in Figure 1 from left to right. 2. Janos Hajdu “Diffraction before destruction,” talk at the Nobel Symposium on Free Electron Laser Research, 2015. 4. N. Saito et al. "Attosecond streaking measurement of extreme ultraviolet pulses using a long-wavelength electric field." Scientific reports 6 (2016): 35594. Licensed under a Creative Commons Attribution 4.0 International License. HIE-ISOLDE advances the high energy frontier of the facility. Technological advances in high-power laser systems have given rise to the fast-growing and dynamic research field of laser-driven accelerators and radiation sources. Experimental and theoretical work on these topics advanced rapidly with the development of chirped-pulse amplification for lasers, which shared the 2018 Nobel Prize in Physics. This allowed for short duration laser pulses to be amplified and focused to such high intensities that electrons are stripped from their parent nuclei and oscillate at close to the speed of light in the laser fields. At such high intensities, interactions are highly non-linear, meaning that small changes to the initial conditions can produce dramatically different results, often in ways which are difficult to predict or fully model. In experiments of this kind, there are many parameters in the laser system and interaction geometry that can be tuned to change the performance. Many of these can be also interdependent, adding to the complexity of interpretation. With so many dimensions to explore it is unlikely that the correct set of initial parameters will be chosen by chance, and so optimisation becomes very slow. In this situation it is advantageous to borrow from the on-going machine learning revolution and let computers do the hard work for us. This is what an international team of researchers did in an experiment at the Central Laser Facility in the UK. Firstly, they developed the technological capability to perform high intensity laser interactions at a relatively high repetition rate (5 shots per second). Then they gave a genetic algorithm control of the laser pulse shape and programmed it to optimise the x-ray source. After 30 minutes the algorithm had more than doubled the x-ray yield from the experiment, by optimising the heating process in a target of clustered argon gas. Following the experiment, it took significantly longer to figure out what the algorithm had done and why! The results of this experiment, just published in Applied Physics Letters, show that the algorithm converged towards a laser pulse temporal shape with an initially gradually rising intensity ending with a sharp peak in intensity and rapid drop. In this experiment, the laser pulse was focused onto a jet of clustered argon, which are very efficient absorbers of laser radiation, once they have expanded. However, this expansion process requires some time and so a gradual rising edge allows for this. Then, once the conditions are optimal for laser absorption, the high-intensity spike arrives and rapidly heats the plasma and leads to increased x-ray production. This work is the first attempt at applying machine learning techniques to such high intensity laser interactions, building on previous work with lower power but higher repetition rate laser systems. This approach allows for rapid exploration of a high-dimensional parameter space, without requiring prior understanding of what combination of parameters might be advantageous. As well as increasing the performance of the system, it also gives a new tool for understanding the physics of these systems by analysing the reasons behind the improved performance. Furthermore, active feedback techniques can also be used to stabilise performance of some system to a nominal level, adjusting laser parameters to compensate for changes in environmental conditions or aging of components. It is clear that use of such techniques will be of key importance in future experiments of this kind, and in much larger scale projects to build national and international scale facilities based on laser-plasma acceleration. Crab cavities will help increase the luminosity of collisions in the High-Luminosity upgrade of the LHC. European collaboration pushes towards Conceptual Design Report, expected to be completed towards the end of next year. CERN, GSI, POLITO and POLIMI carry out an extensive characterization campaign of a broad range of advanced materials for applications in future particle accelerators, as well as high-technology industrial domains. The collaboration characterized both novel materials, currently under development, as well as commercially available carbon-based materials, including thin-film coatings. This work has been developed in the context of the H2020 project ARIES. The development and use of high thermal performance materials, with low mass density and excellent resistance to thermal shocks, is increasingly becoming an enabling technology in a broad range of industrial and research applications. In industry, these materials are appealing in a number of fields, such as high power electronics, avionics, energy production, aerospace, nuclear engineering, and luxury sports automotive. Researchers and engineers working in these domains require materials with efficient thermal management, high temperature resistance and mechanical robustness. In the field of fundamental research, some components of the high-energy particle accelerators largely share these requirements. In fact, beam-intercepting devices (BID), such as collimators, beam absorbers, catchers, dumps and targets, are routinely exposed to the impact of highly energetic and intense particle beams, making the selection of key materials extremely important. This is especially true for the next-generation of accelerator facilities like the High-Luminosity upgrade of LHC (HL-LHC) at CERN, the Facility for Antiproton and Ion Research (FAIR) at GSI, or the proposed Future Circular Collider (FCC). They will exhibit increased beam intensities (in some cases by orders of magnitude). In combination with the shorter pulse lengths and greater particle densities requested by physics experiments, this leads to significantly higher transient thermo-mechanical loads in all beam-intercepting devices. Additionally, materials for some of these components must possess high electric conductivity to limit the destabilizing effects they may induce on particle beams circulating in their close vicinity. Unfortunately, no existing material possesses the combination of physical, thermal, electrical and mechanical properties, imposed by such extreme working conditions. For instance, the material currently employed for the absorbers of LHC Collimator jaws (a two-dimensional carbon-fibre-reinforced carbon composite – CFC – ) is predicted not to satisfy the full set of requirements imposed by the severe working conditions expected in the HL-LHC from 2026. In particular, numerical simulations indicate that the limited electrical conductivity of CFC may induce electro-magnetic instabilities in the particle beam. In recent years, CERN has collaborated with international laboratories, universities and industries to address these issues. After having commenced in the framework of EuCARD and EuCARD-2 projects, this partnership is continuing within H2020 ARIES collaboration, Work Package 17 (PowerMat), a Joint Research Activity, in cooperation with Work Package 14 (Promoting Innovation). Carbon-based materials have a long history of applications in beam intercepting devices and their harsh radiation environments, thanks to their low activation, high radiation-hardness, thermal stability in combination with improved strength at high temperatures and low density. PowerMat focuses on the exploration of advanced types of carbons, such as various grades of isotropic graphite, thermal pyrolytic graphite, CFC and carbon foams. It has also targeted the development of novel composite materials based on the combination of graphite and diamond with metals or high performance ceramics. In this context, a family of new graphite-matrix composites, reinforced with molybdenum carbides (Molybdenum Carbide – Graphite, MoGr) has been co-developed by CERN and Brevetti Bizz, an Italian SME, with the goal of increasing the electrical conductivity of the materials for the primary and secondary collimator jaws, while maintaining or improving the beam impact robustness of CFC. To further enhance the electrical conductivity of the jaw surface exposed to the beam, a thin film of electrically conductive metals or ceramics can be applied to the MoGr bulk material. Solutions under development are, for example, molybdenum, copper and titanium nitride coatings. In order to assess the performance of these materials and gain a deeper understanding of their response to beam-induced dynamic thermal shocks, dedicated experiments are carried out at facilities like CERN’s High-Radiation to Materials (HiRadMat), GSI’s UNILAC and SIS 18 accelerators, with short-pulse, high-intensity beams. WP17 partners have performed an extensive characterization of both commercially available advanced materials and newly developed composites. The characterization performed included the study of materials morphology and microstructure, the measurement of their thermal, electrical and mechanical properties, as well as their behaviour in ultra-high vacuum, and the study of application of thin films on the surfaces of the bulk materials. This campaign has allowed quantifying the advantages of novel composites, compared to commercial materials and has laid the ground for further optimizations and improvements in the development of advanced thermal management materials. It will be complemented in the course of the projects by additional characterization campaigns, including examination after long-term irradiation and experiments under high intensity particle pulses. During the course of this work, the ARIES Consortium also plans to engage experts from space, aviation, car and electronic industry to exchange ideas on the latest developments in design, manufacture, testing and applications of novel thermal management materials. These industries could consider the novel materials developed in this WP for advanced engineering solutions, efficient energy solutions and thermal management, given their excellent thermal conductivity and high mechanical and shock resistance. The enormous size of today’s gantries poses constraints on future hadron-therapy facilities. As particle physics demands ever more powerful accelerators, the tendency is to go bigger. Dr Ralph Assmann, a leading scientist at DESY believes a completely different approach is needed. Plasma accelerators can be powerful, yet up to 1,000 smaller than conventional accelerators. Driven by lasers or particle beams, the density oscillations in a plasma can sustain much larger fields, overcoming the breakdown limit of RF cavities. Any electrons trapped in the wake of the plasma wave, may be accelerated up to several GeV in a few millimeters. The effect is known as wakefield acceleration. In recent years, the energies accessible to plasma wakefield accelerators have risen sharply. Scientists like Dr Assmann want to increase these energies, but also to improve the stability and quality of the electron beams coming out of the accelerator. This would make plasma accelerators suitable for particle physics but also a host of other applications like drivers for Free Electron Lasers. Dr Assmann is coordinating the project EuPRAXIA to come up with a design for the world’s first plasma wakefield accelerator with an energy of 5 GeV that can actually be used for research. That may not seem as an impressive energy but as Dr Assmann points out; you have to walk before you can run. The EuPRAXIA consortium, comprising 40 laboratories and universities is addressing key questions, like driving the plasma with a laser or a particle beam, accelerating the electrons from the plasma or using an external injector, and employing a single stage or a multi-staged approach. The conceptual design report is expected to be completed towards the end of next year. In order to produce a fully integrated and coherent report the frequent interaction between the work groups designing the different elements of the facility is essential. Moreover, as the layout of EuPRAXIA starts to take shape, it is time to involve the external stakeholders: the companies which will supply the technology, the scientists who will use the facility, and the students who will run it in the future. The latest of the EuPRAXIA collaboration meetings took place in Liverpool on 4 – 6 July 2018. The last day of the meeting took the form of a public event at the Liverpool Arena and Convention Centre. The Symposium ‘Quantum Leap Towards the Next Generation of Particle Accelerators’ was a special occasion to showcase the progress made within the EuPRAXIA Design Study alongside the future of plasma accelerators, advanced laser technology, and industry opportunities gathering together scientists, students, and representatives from over 40 companies. The morning session of the Symposium featured talks from research leaders about the science and technology of plasma accelerators. Hands-on demonstrations helped to explain students how this new type of accelerators works and how the particle beams can be optimized. A poster session showcased the results from EuPRAXIA research to date. In the later part of the day the event focused more on the importance of industry-academia collaboration for large scale research infrastructures. It included an industry exhibition highlighting the latest technologies and market-ready products, as well as talks about the wide range of applications in which accelerators find use. New technique opens exciting opportunities for complete control over spatio-temporal properties of intense laser focus. The Balkan states are joining forces to set up a South-East Europe International Institute for Sustainable Technologies (SEEIIST) with the primary goal of promoting ‘science for peace’ and the development of science and technology. This research infrastructure will be based on the CERN model and is intended to further mitigate tensions between the countries in the region by encouraging scientists and engineers to work together on one common goal. Two scientific options are currently being discussed: the first is a fourth-generation synchrotron light source with intense beams from infrared to X-ray wavelengths; and the second is a state-of-the-art cancer therapy machine using protons and heavy ions for patient treatment with a strong research programme. Both options will be based on scientific excellence and hence on innovative cutting-edge science and technology. This international collaboration platform is also being designed to educate young scientists and engineers in the region and reverse the brain drain. Studies are currently underway to ensure the facility’s sustainability and a layer of technology transfer is also being included for the technology to be exploited by industry. The concept of setting up a science institute promoting ‘science for peace’ in South-East Europe was first proposed by Herwig Schopper in autumn 2016 at a meeting of the World Academy of Art and Science in Dubrovnik, Croatia. At around the same time, the setting up of a regional synchrotron light source or cancer therapy machine was also being discussed in Montenegro by the Minister of Science Sanja Damjanovich and her two international advisors Hans Specht (Heidelberg University & Former DG GSI) and Nicholas Sammut (University of Malta). This was the perfect opportunity to join both ideas together and to propose the setting up of such an institute for the benefit of all the Balkan states. The idea took traction immediately and on the 25th of October 2017, a Declaration of Intent to establish SEEIIST, was signed at CERN by ministers of science or their representatives, independent of where the final location would be. The initial signatories were Albania, Bosnia and Herzegovina, Bulgaria, Kosovo, The Former Yugoslav Republic of Macedonia, Montenegro, Serbia and Slovenia. Croatia also agreed in principle and Greece participated as an observer. Just a few months later at the end of January 2018, a scientific forum was organised at the International Centre for Theoretical Physics (ICTP) in Trieste, Italy where the concept studies worked out by two groups of distinguished international specialists were presented and discussed. The forum was supported by the United Nations Educational, Scientific and Cultural Organisation (UNESCO), the International Atomic Energy Agency (IAEA) and the European Physical Society (EPS). Over 100 participants including scientists, engineers and policy makers from universities, industry, government and regional or international organisations attended the meeting. Amongst others, the event was also attended by the European Strategic Forum on Research Infrastructures (ESFRI) and by the European Commission, which was represented by Robert-Jan Smits (DG Research and Innovation, European Commission). At the Forum, representatives from the IAEA declared an interest in supporting the initiative through training programmes and the European Union representatives also showed favourable support of the project potentially providing resources to support the preparation of the detailed conceptual design. Just one week after the Trieste forum, the SEEIIST first steering committee meeting took place in Sofia, Bulgaria, which currently holds the EU presidency. The committee consisted of representatives from each of the signatory countries and was initially chaired by the Minister of Science of Montenegro. The meeting was introduced by the Bulgarian president Rumen Radew who showed strong interest and promised support of the initiative. With the initiative gaining more and more momentum, the next step is to take a decision on which of the two scientific options to choose to build and to set up the first executive team to be governed by the steering committee. This designation is without prejudice to positions on status and is in line with UNSC 1244/1999 and the ICJ opinion on the Kosovo Declaration of Independence. Header image: Participants at the Trieste Forum. Following the competitive tender for phase-3, only two solutions could be awarded a work order. Three were evaluated and considered promising. “I think Marie Skłodowska-Curie represents courage; she was able to overcome all these challenges and to pursue something fearlessly. It's because of her legacy that people like me are able to come overseas and pursue our own dreams,” says Jacinta Yap, a Marie Skłodowska-Curie research Fellow. On 7th November 2017, the twice Nobel Prize winner’s 150th birth anniversary was celebrated along with the many successes made possible by the European Union’s Marie Skłodowska-Curie Actions (MSCA) over the past 20 years, with a particular focus on accelerator science. This was done through simultaneous events at CERN in Geneva, at Ludwig Maximilian University in Munich and at the University of Liverpool. Marie Skłodowska-Curie conducted pioneering work in radioactivity. She was the first woman to be awarded a Nobel Prize and to win two of them in different fields of science. Born in Poland, but having to resettle in France to pursue her career, she ultimately became the first woman to be a professor at the University of Paris. Her interests included medical applications of her work: during World War I she developed mobile radiography units to provide X-ray services to field hospitals. The Marie Skłodowska-Curie Actions (MSCA) have supported the training of more than 100,000 researchers at all careers stages over the past two decades. There have been several innovative training networks in accelerator science and technology. Professor Carsten Welsch, Head of Physics at the University of Liverpool and based at the Cockcroft Institute, has initiated and coordinated five of these Pan-European networks and organised the Marie Curie day. Current and past Fellows presented their research results in the form of posters at CERN, in Munich and Liverpool to a diverse audience. In Liverpool, almost 100 local high school students attended a series of activities at the University. They started their day with an introduction by Madame Curie herself (played by an actress) and a live connection to CERN for a talk by Dr Marco Silari about the “international impact of Marie Skłodowska Curie Actions on research at CERN”. The students then moved to the Central Teaching Laboratory, where they enjoyed hands-on activities on radioactivity and a poster session about MSCA-funded research and training activities. Students taking part in hands-on activities during Marie Curie Day at the University of Liverpool. Image credit QUASAR Group. They also participated in a poster competition about “Women in Science”. Their activities finished with a talk by Prof Welsch about “Accelerating Researcher Training” that was also live-streamed at CERN. A film contributed by the European Commission’s DG EAC, Martine Reicherts, provided additional background information and the view of the EU. Finally, the evening saw a live-streamed talk by Prof Katia Parodi about the “impact of MSCAs on education and research in ion beam cancer therapy”. On the afternoon of the same day, a poster session hosted at CERN offered the opportunity to young researches to present their work spanning different fields from searches of new physics to the application of advanced accelerator technology. Since 2004, more than 490 fellows pursued their research at CERN while presently about 134 participants in the programme benefit for the international academic environment offered by CERN. Following past year's success, in 2018, CERN will coordinate two new MSCA actions: EASITrain that aims to advance the fields of superconductivity and cryogenics and RADSAGA focusing on electronics exposed to raditation. Both projects, brings together ten academic institutes and research centres of excellence and the leading European companies to advance these fields and provide training for 15 Early-Stage Researchers each. Finally, it should be noted that CERN is a beneficiary, in two other new MSCA ITN networks, namely CLOUD-MOTION related to the CLOUD experimnet and INSIGHTS that aims to develop advanced statistical methods and apply them to current research in particle physics and beyond! Poster Session at LMU Munich for the Marie Curie Day 2017. Image credit QUASAR Group. This view is shared by research Fellows Jacinta Yap and Bianca Veglia. “I didn’t really know what I wanted to do at university. Then I came across medical physics. It’s got everything that I’m interested in and what motivates me: science, medicine, physics and all the technical aspects from engineering. Jacinta Yap, Marie Curie Fellow. Image credit QUASAR Group. “As a medical physicist, I will work in a hospital and interact with patients, doctors and machines, seeing first-hand the difference I am making. Bianca Veglia is also a Marie Curie Fellow, based at the Cockcroft Institute in the UK. She is involved in the Accelerators Validating Antimatter physics (AVA) project, which is studying the properties of antiparticles. After graduating she used her knowledge of physics to provide credit risk assessment for a large consulting company before her love of science took her back to research. “I easily found a position at a big credit risk management company because they hire lots of physicists. The work wasn’t bad but it was routine and I missed physics too much. I needed to feel part of something important. 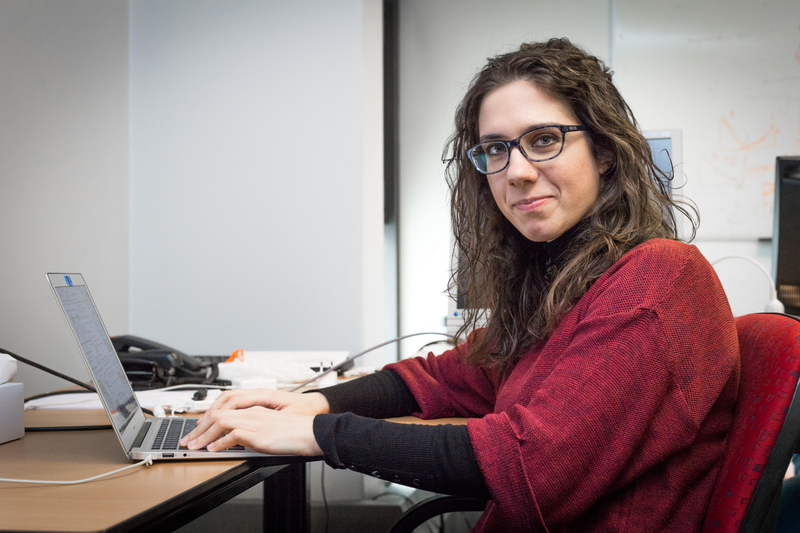 Bianca Veglia, Marie Curie Fellow during a secondment to CERN. Image credit QUASAR Group. “I am involved in this project about the low energy antiproton ring (ELENA) at CERN. The ELENA ring was designed to avoid the use of thin foils to get low energy antiprotons, as thin foils lead to a lot of particles being lost. This is thrilling because it means ELENA will increase the availability of very low energy antiprotons for many different experiments. “Because the energy is low, particles with the same charge repulse each other, creating effects within the beam. I'm studying this and also how an electron cooler can be used to keep the beam in the right shape. When it’s decelerated the particles spread so the electron cooler helps keep a slim beam inside of the machine. Anna Stakia has been a Marie Skłodowska-Curie fellow in CERN’s Experimental Physics department since May 2016. She is currently working on New Physics searches and Machine Learning. “Marie Skłodowska-Curie is without a doubt one of the most eminent figures in physics, and in science in general. I feel honoured to be part of a programme that carries her name and I am personally incredibly inspired by it. Further information about Fellows and their projects, as well as all talks from Marie Curie Day 2017 can be found at marie-curie-day-2017.org. Header image: Marie Curie Day – 7th November 2017. Image credit QUASAR Group.